"LAYDOWN MINNOW- REGULAR, JUST WAKASAGI "
LAYDOWN MINNOW uses a fixed weight system to make extra room for air and a wide body design to create a highly buoyant lure, to create an attractive action that a thin minnow body lure cannot imitate. On a straight retrieve it wobbles with slight roll, and darts quickly side to side on twitch or jerk. It has enough attraction to bring bass up from deep in the water. The tactic is to focus on "pauses" to get bass to take the bait. By simply adjusting the pause period to the activity of the bass, you can adapt to almost any situation. Simply choose the best size to match the bait fish, either "REGULAR" or "JUST WAKASAGI". 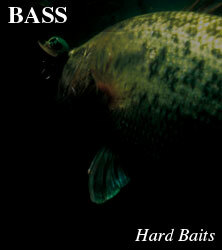 You can hook on to a big fish pattern, with the NORIES bait range series, LAYDOWN MINNOW.